(Nanowerk News) Imagine creating novel devices with amazing and exotic optical properties not found in Nature—by simply evaporating a droplet of particles on a surface. By chemically building clusters of nanospheres from a liquid, a team of Harvard researchers, in collaboration with scientists at Rice University, the University of Texas at Austin, and the University of Houston, has developed just that. Schematics of two types of optical circuits: the three particle trimer functions as a nanoscale magnet, while the seven particle heptamer exhibits almost no scattering for a narrow range of wavelengths due to interference. The finding, published in the May 28 issue of Science, demonstrates simple scalable devices that exhibit customizable optical properties suitable for applications ranging from highly sensitive sensors and detectors to invisibility cloaks. Using particles consisting of concentric metallic and insulating shells, Jonathan Fan, a graduate student at the Harvard School of Engineering and Applied Sciences (SEAS), his lead co-author Federico Capasso, Robert L. Wallace Professor of Applied Physics and Vinton Hayes Senior Research Fellow in Electrical Engineering at SEAS, and Vinothan Manoharan, Associate professor of Chemical Engineering and Physics at SEAS and Harvard's Physics Department, devised a bottom-up, self-assembly approach to meet the design challenge. "A longstanding challenge in optical engineering has been to find ways to make structures of size much smaller than the wavelength that exhibit desired and interesting properties," says Fan. "At visible frequencies, these structures must be nanoscale." In contrast, most nanoscale devices are fabricated using top-down approaches, akin to how computer chips are manufactured. The smallest sizes that can be realized by such techniques are severely constrained by the intrinsic limits of the fabrication process, such as the wavelength of light used in the process. Moreover, such methods are restricted to planar geometries, are expensive, and require intense infrastructure such as cleanrooms. "With our bottom-up approach, we mimic the way nature creates innovative structures, which exhibit extremely useful properties," explains Capasso. "Our nanoclusters behave as tiny optical circuits and could be the basis of new technology such as detectors of single molecules, efficient and biologically compatible probes in cancer therapeutics, and optical tweezers to manipulate and sort out nano-sized particles. Moreover, the fabrication process is much simpler and cheaper to carry out." The researcher's self-assembly method requires nothing more than a bit of mixing and drying. To form the clusters, the particles are first coated with a polymer, and a droplet of them is then evaporated on a water-repellent surface. In the process of evaporation, the particles pack together into small clusters. Using polymer spacers to separate the nanoparticles, the researchers were able to controllably achieve a two nanometer gap between the particles—far better resolution than traditional top-down methods allow. Two types of resulting optical circuits are of considerable interest. A trimer, comprising three equally-spaced particles, can support a magnetic response, an essential property of invisibility cloaks and materials that exhibit negative refractive index. "In essence, the trimer acts as a nanoscale resonator that can support a circulating loop of current at visible and near-infrared frequencies," says Fan. "This structure functions as a nanoscale magnet at optical frequencies, something that natural materials cannot do." Heptamers, or packed seven particle structures, exhibit almost no scattering for a narrow range of well-defined colors or wavelengths when illuminated with white light. 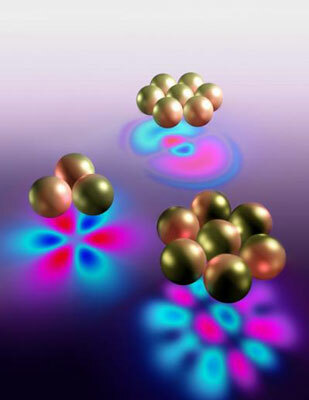 These sharp dips, known as Fano resonances, arise from the interference of two modes of electron oscillations, a "bright" mode and a non-optically active "dark" mode, in the nanoparticle. "Heptamers are very efficient at creating extremely intense electric fields localized in nanometer-size regions where molecules and nanoscale particles can be trapped, manipulated, and detected. Molecular sensing would rely on detecting shifts in the narrow spectra dips," says Capasso. Ultimately, all of the self-assembled circuit designs can be readily tuned by varying the geometry, how the particles are separated, and the chemical environment. In short, the new method allows a "tool kit" for manipulating "artificial molecules" in such a way to create optical properties at will, a feature the researchers expect is broadly generalizable to a host of other characteristics. Looking ahead, the researchers plan to work on achieving higher cluster yields and hope to assemble three-dimensional structures at the macroscale, a "holy grail" of materials science. "We are excited by the potentially scalability of the method," says Manoharan. "Spheres are the easiest shapes to assemble as they can be readily packed together. While we only demonstrated here planar particle clusters, our method can be extended to three-dimensional structures, something that a top-down approach would have difficulty doing."